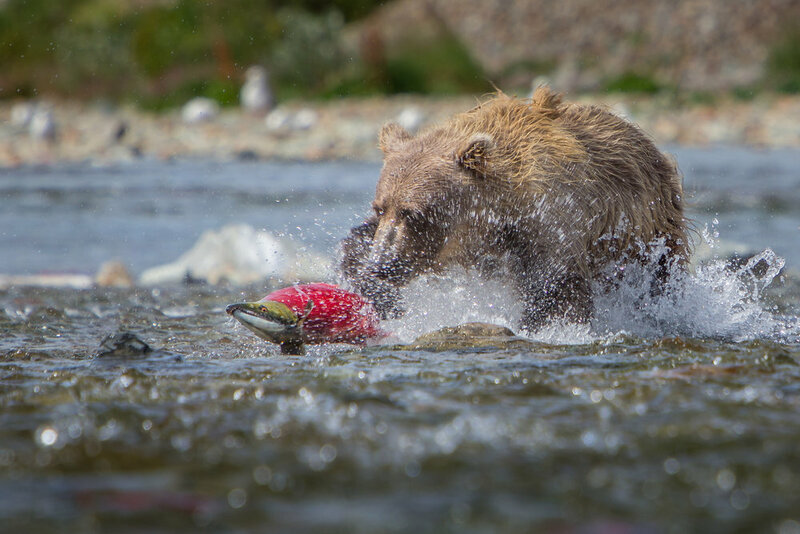 Towards the end of June, hundreds of thousands of sockeye salmon (Oncorhynchus nerka) make their way from the Pacific Ocean into the freshwater rivers of southern Alaska for their annual spawning event. 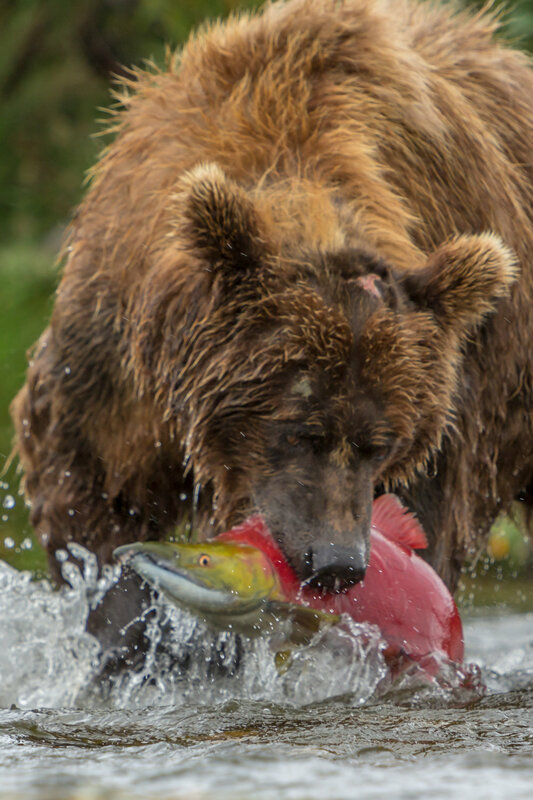 During the peak of this massive migration, sections of the rivers appear to turn a vibrant red as the densely packed salmon fight to swim upstream. 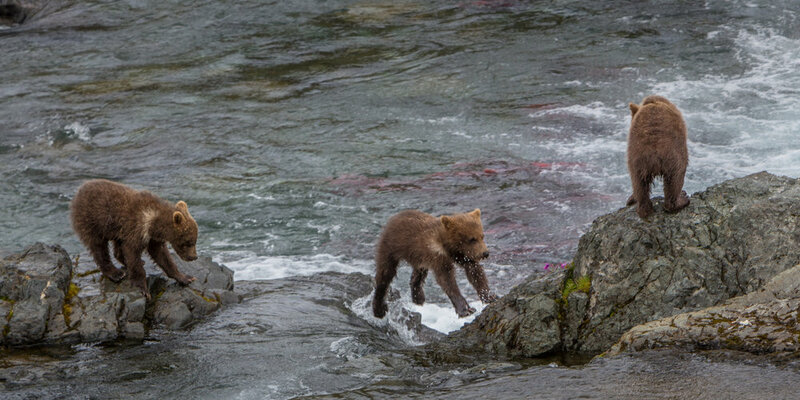 This influx of salmon doesn't go unnoticed by the surrounding wildlife. 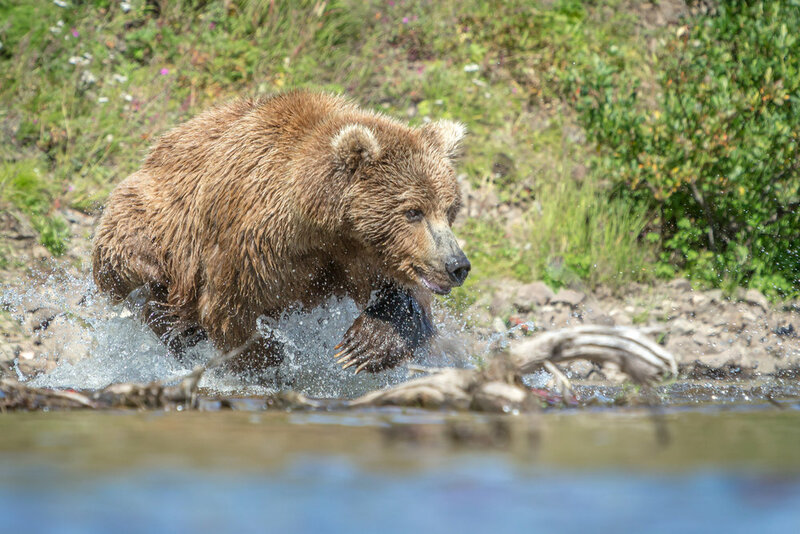 In Katmai National Park and the surrounding regions, Alaskan brown bears (Ursus arctos horribilis) are well aware of the migration, and take full advantage of the seemingly endless buffet of fish laid out for them. 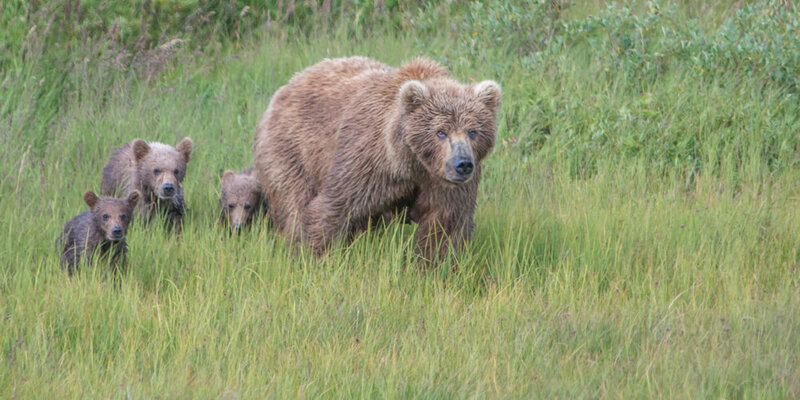 Southern Alaska has a healthy and concentrated population of brown bears due to the wide variety of food resources available. 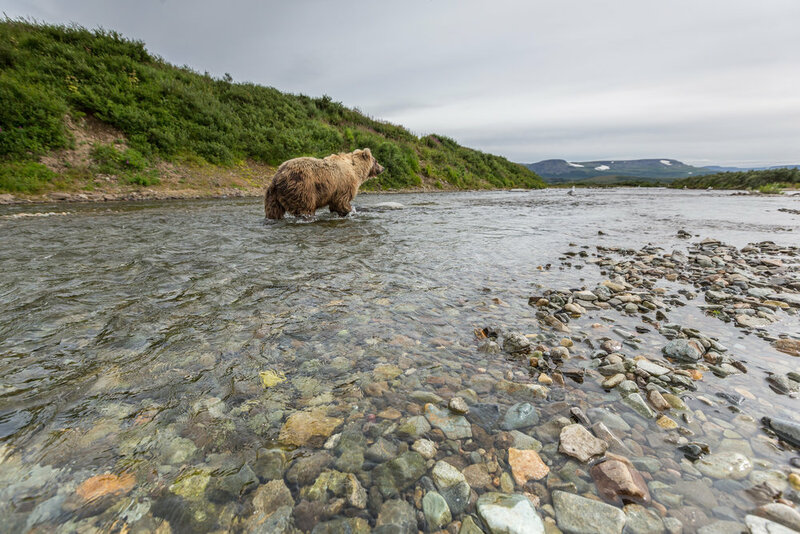 Clams, sedge grass, berries, carrion and of course salmon, allow for these bears to reach such massive sizes sometimes weighing as much as 1,200 pounds. 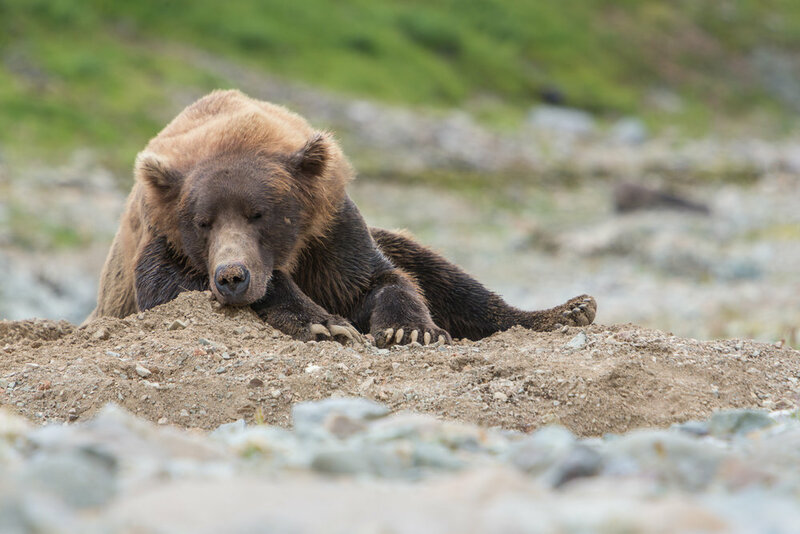 After gorging their stomachs through spring and summer, around mid-October Alaskan brown bears begin to hibernate in underground dens. For several months they will lower their heart rate to approximately 8-10 beats per minute, 1 breath per minute and will nearly shut down their kidneys to recycle urea into proteins to maintain muscle mass. 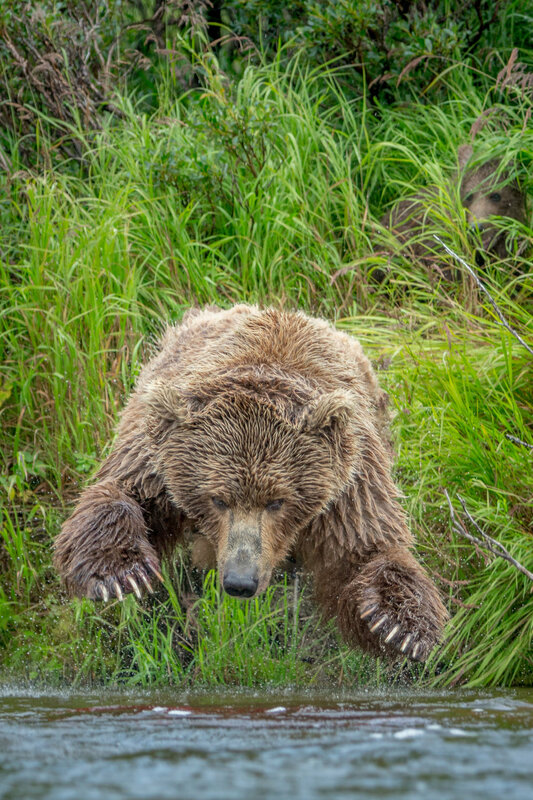 A bear will still burn approximately 4,000 calories a day, and may loose up to 33% of their body weight by the time they emerge. 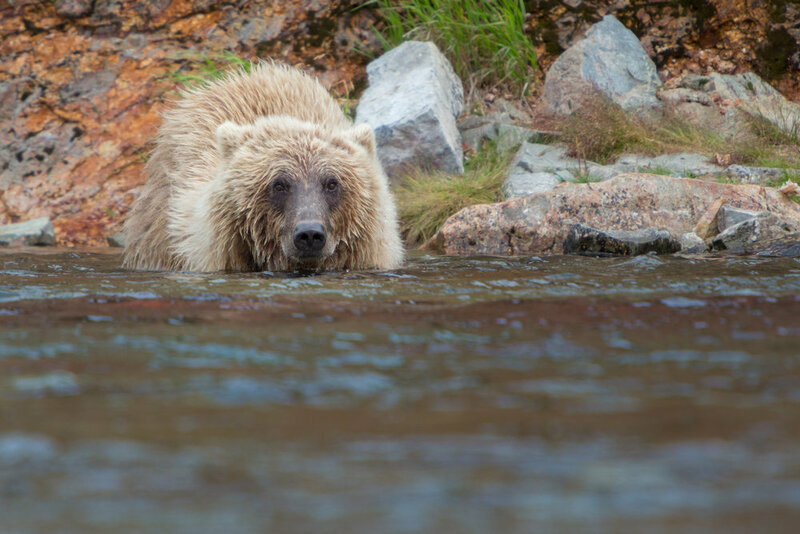 A large sow waiting for the perfect opportunity to catch a salmon. 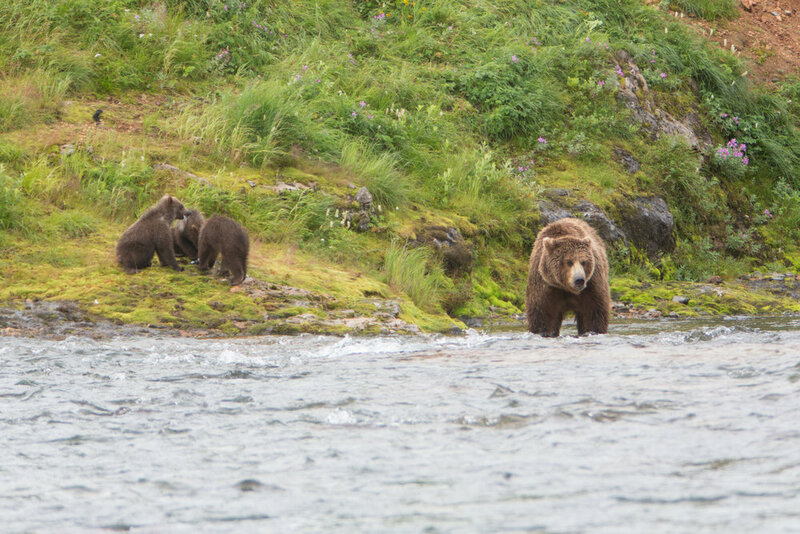 Her 3 cubs played on the riverbank as she fished. 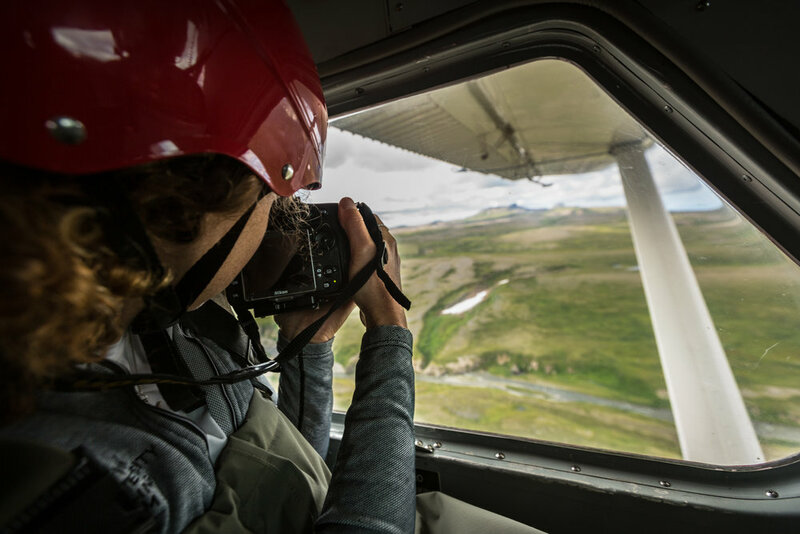 This opportunity to photograph the Alaskan brown bear near Katmai National Park came from being a recipient of the Art Wolfe Next-Generation Photographers Grant. Myself and 7 other photographers received the grant to work with Art and his assistant Gavriel Jecan. Without a doubt this was one of the most influential trips of my life. 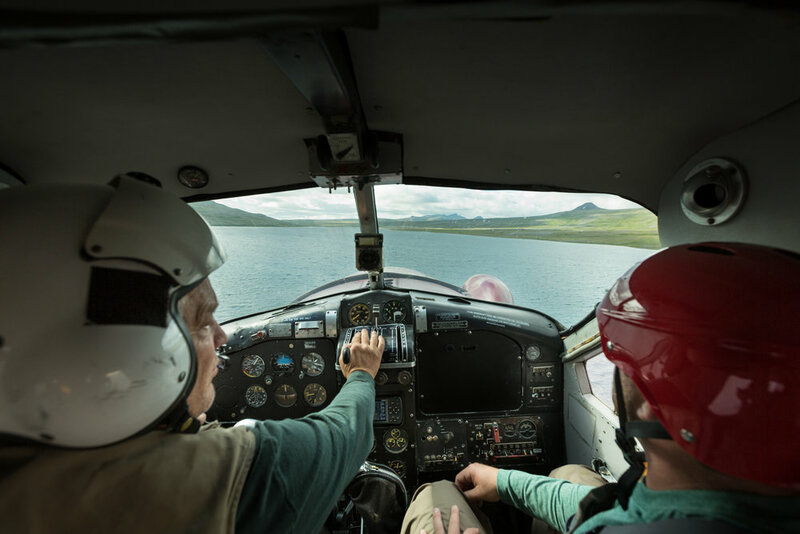 I remember the first time the float plane took off heading for what seemed like could only be described as the final frontier, and trying to absorb as much of that moment as I could. 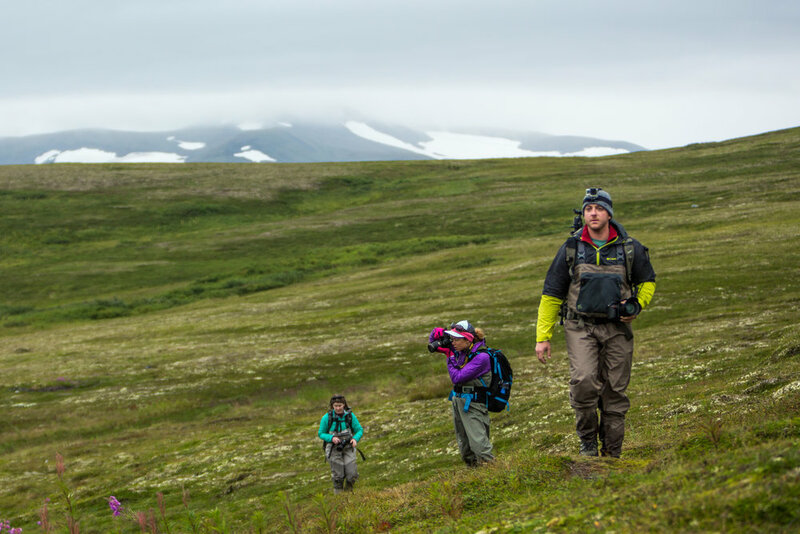 Walking on the ridge line before hiking down a steep slope to the rivers edge for the first time, we saw 4 large brown bears in close proximity to each other and us. I must admit, for someone who spends most of his time looking at invertebrates, immersing myself in such a large animals domain was a slightly creepy thought. It didn't take long to realize the bears had no interest in us, and never even took the moment to give us a look upon our entrance. They had a river bursting with sockeye salmon full of roe, which was far more enticing. 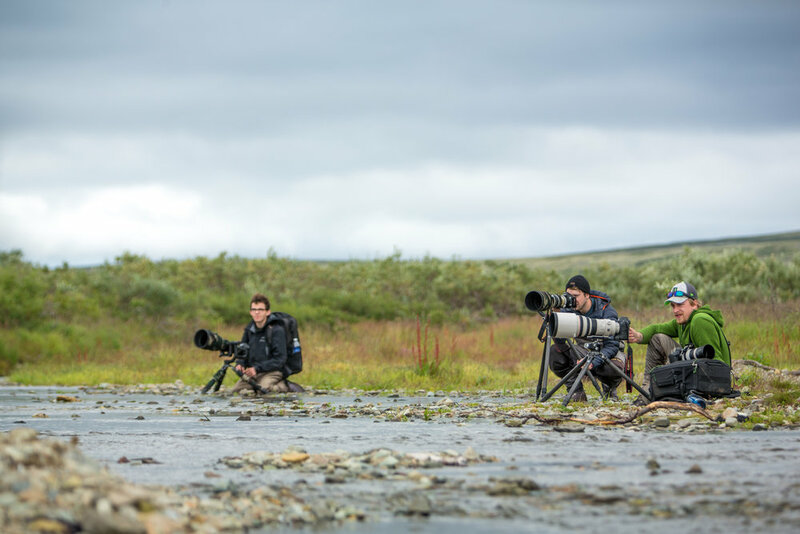 Over the next few days we spent plenty of time with the bears, and as hard as it can be sometimes in a group of photographers, you had to down the camera to stop and just appreciate the action unfolding around you. 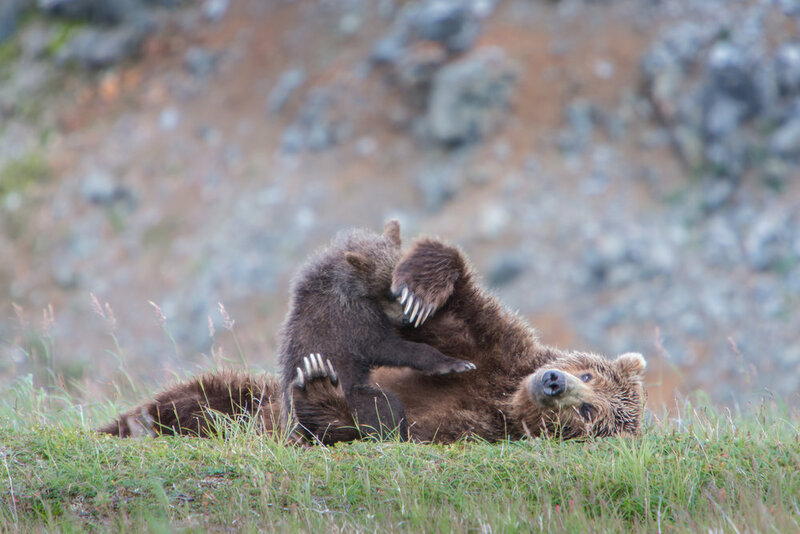 The Alaskan brown bear is a top predator in Katmai National Park and it's surrounding areas, and has little to fear from other wildlife it shares this environment with. Their largest threats come from aggressive encounters with other bears, or being hunted by humans during the spring or fall hunting seasons. 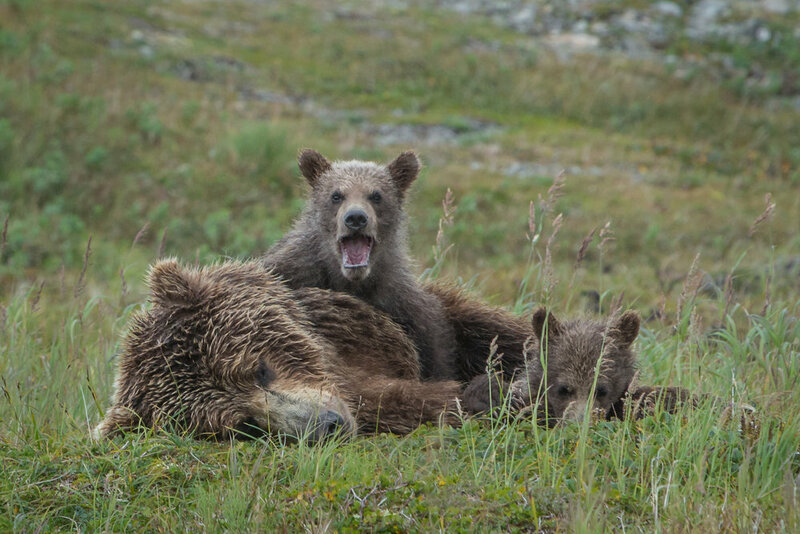 It's important to note that while Alaskan brown bears and American black bears have healthy populations, there are many other bear species threatened with declining populations worldwide. The sun bear, asiatic black bear, sloth bear, and the andean bear haven't had equal publicity as pandas and polar bears, but are faced with a similar troubling future. Habitat loss, over hunting and poaching have led to steep declines in these species. I believe awareness and education leads to better conservation. 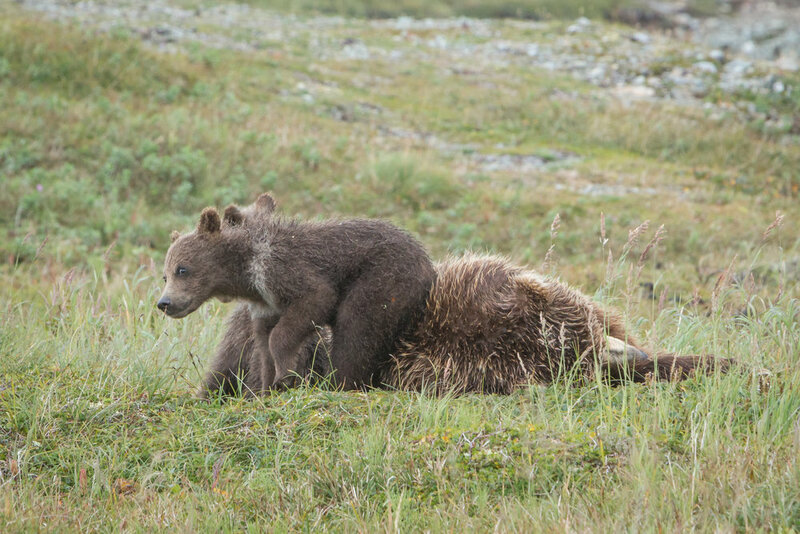 If you're not familiar with these bear species, I urge you to take a moment to learn about them and discover their interesting and fascinating stories. As the salmon run comes to an end, the river banks are littered with fish carcasses. 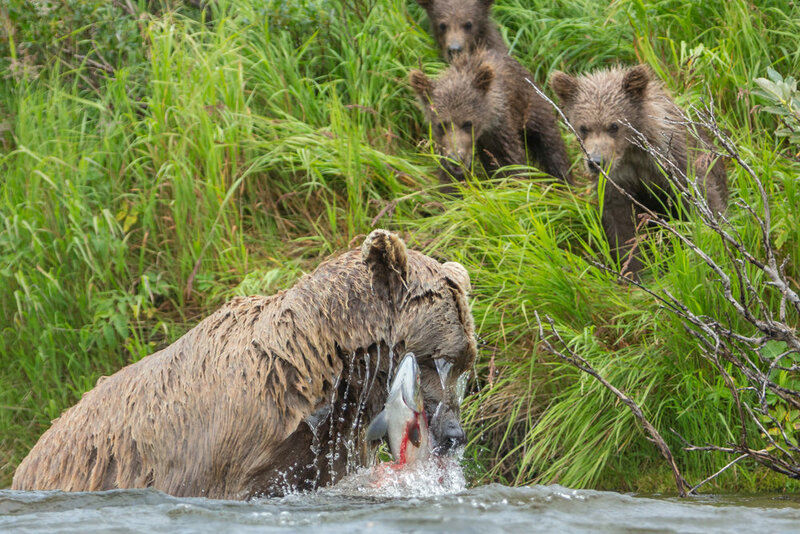 Some only partially eaten as the bears will stick to consuming the skin, brains, and eggs when the salmon are plentiful. 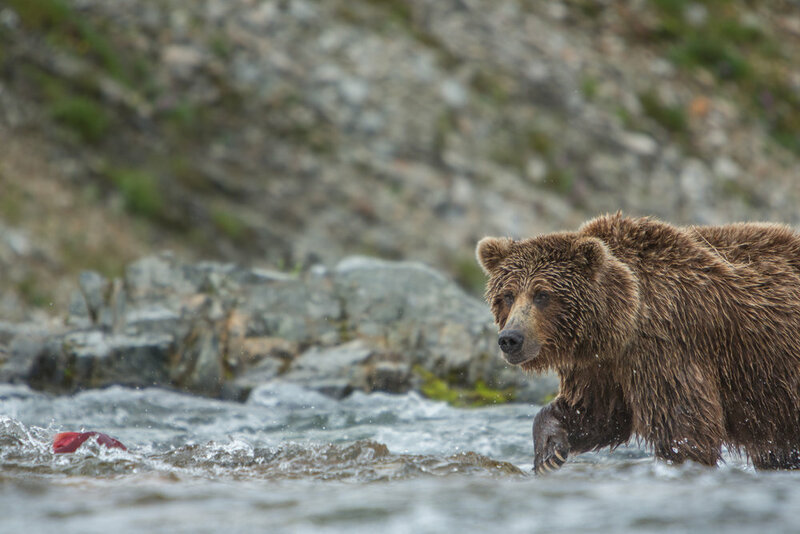 Gulls, eagles, and other wildlife will join the bears to scavenge through the remains. 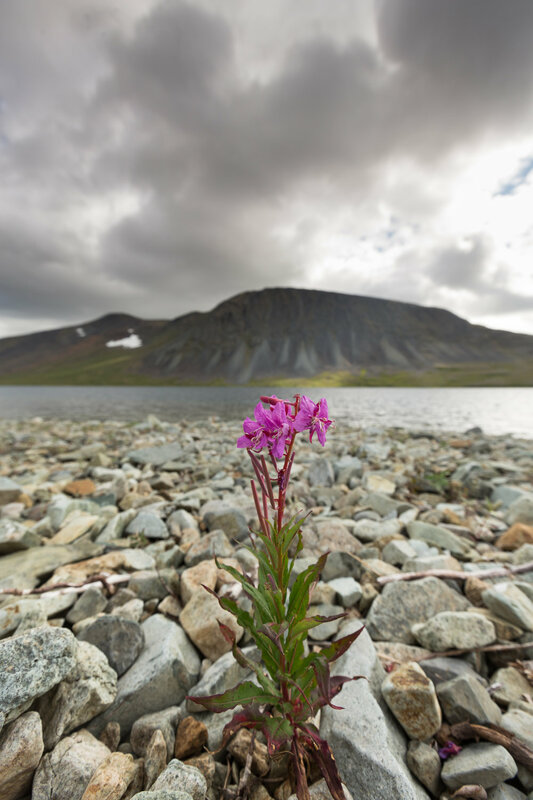 Nearly nothing is wasted. A healthy lesson we can all learn from.